Stardock is best known for its strategy games. Well, technically, we're best known for our software and technology, but we've always loved making strategy games. Star Control is not a strategy game. It is a role-playing game. And the best RPGs have excellent writing. At the very start, we knew that we would need to work with talented writers. In 2013, we hired Chris Bucholz to lead the writing effort for Star Control. His How-To guides on Cracked and his ability to write both serious and comedic stories was compelling. No one has spent more time on Star Control: Origins than he has. One decision we made early on is that Star Control was going to focus on telling stories. The core gameplay loop of Star Control was crucial to keeping players engaged, but we believe that players want to see games that put great effort into creating compelling narratives. Games have the advantage of being interactive. We don't have to put the player on rails. We can make sure their actions have real consequences, and that those consequences lead to interesting narrative destinations. This means that every single quest in the game is hand-crafted by Sci-Fi writers. There are no "Go gather X to get Y," randomly generated ones. Instead, we have actual people write "Go gather X to get Y" by hand (cough). More relevantly, by hand-crafting the quests, we can make the lore itself a reward, rather than simply giving out new equipment. 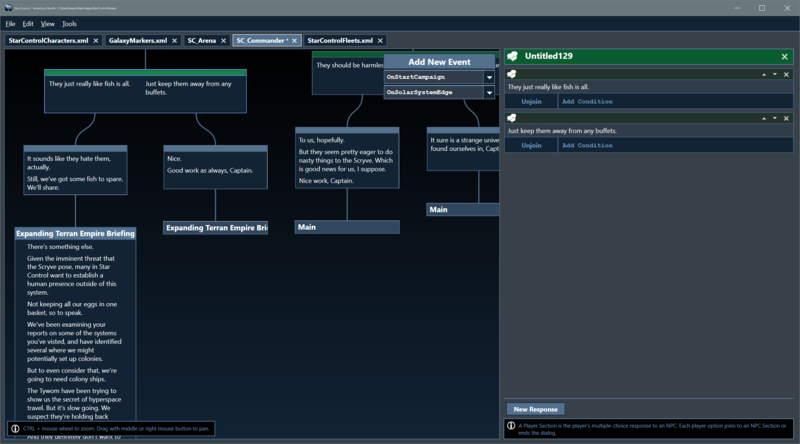 In the example above, your choices can result in new story paths opening up and new variables and flags being set (which the author can create on the fly since the game exists within a real-time state machine that is decoupled from the engine -- writers can create new variables on the fly). Adventure Studio was developed so that we could begin contracting with more and more Sci-Fi writers who wanted to tell interesting stories without having to be particularly technical. If anyone reading this has ever worked on the Ur-Quan Masters source code or other adventure games, they can probably tell you that you don't normally see quest creation handled like we do in Star Control: Origins. Another decision we made early on was to make sure stories didn't have to be connected from a data point of view. This allows multiple writers to contribute to the game easily (especially in the future). Stories are contained in XML and are placed in the relative dialog folder (each universe in the Star Control multiverse has its own dialog folder so that future modders can create their own universes and collaborate together). This means that a given writer can work on something without fear that they will be stepping on someone else's story (data-wise). How do we avoid nickel and diming players with DLC? How do we avoid running out of story and being forced to send players to...ahem, a different galaxy or something? How do we avoid having repetitive, procedurally generated quests? The way we look at Star Control: Origins is similar to how I imagine the producers of Star Trek looked at that series. Star Control: Origins has a central mission you need to accomplish, but there is no time limit to it. That central mission always exists: protect Earth from annihilation by hostile forces. Even as you deal with the immediate threat in SCO 1.0, other interesting things will continue to emerge. After all, you are the Captain of a fantastical starship whose ongoing mission is to seek out new alien civilizations, explore strange new worlds, and mitigate threats to Earth and its possibly growing empire (depending on your choices). Now, that's all well and good, but how do you do that? That's where, again, Adventure Studio and other creators come in. Since one person's creations won't be stepping on someone else's, the universe will evolve because people will be writing their own stories and sharing them. Moreover, we will of course be adding new adventures as well, and while we don't plan to charge for small additions, we will absolutely be charging a massive gouge-level amount for future expansions. And I mean, like, shameless gouging too, because I need another boat. And I think everyone reading this understands that. But, my boat-fetish will be kept in check by talented sci-fi writers who will be able to create their own stories and share them. The last problem, the galactic problem, is that Star Control: Origins has the Origins (hence, Star Control: Origins) which can send you to alternative universes. So, think of all those fantastic universes you've read about over the years or seen on TV and imagine a scenario where we license those universes and let you take your ship into those places? Ultimately, the quality of the writing will make or break this game. This project has given me a real appreciation for the talent gulf between a competent writer (like me) and outstanding writers. We hope that when you play the game the value of hand-crafted stories and adventures is apparent. If Earth forms colonies will they generate resources for you like SC3? Probably but it won't affect you since you're the captain of a starship, not in charge of colonies. wow, that sounds fantastic! too bad I have no writing talent at all...so I look forward to enjoying whatever is created by those who do! Makes it sound like there could be some nice replayability with things like this and a strong community. Looking forward to see what people come up with. but why to help with that then if it doesn't bring more boats? In Warband you also start as one small captain but what you conquer pays you tribute. Eventually to rule current or your own faction. We have a game in preproduction that fits that. But not Star Control. Star Control is an RPG.